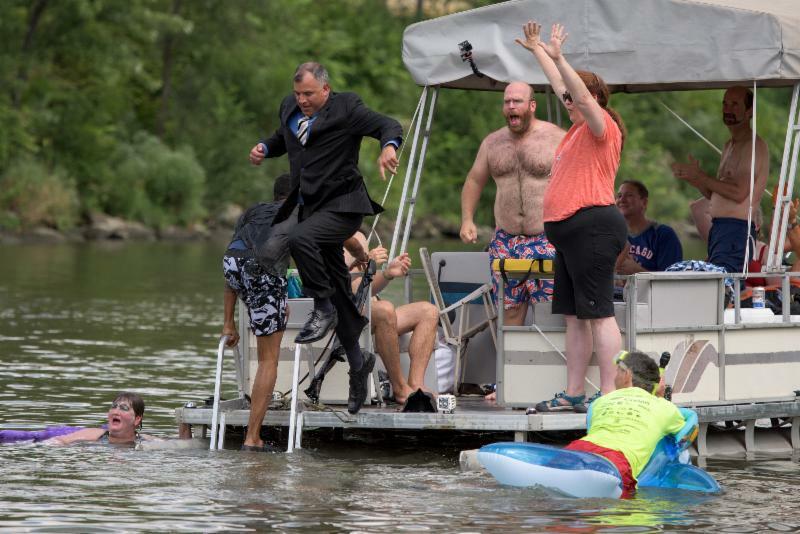 Whether they flipped, flopped, or dove in, public officials, non-profit leaders and agency representatives from southern Cook County jumped for joy into the waters of the Cal-Sag Channel in Blue Island on Aug. 27. 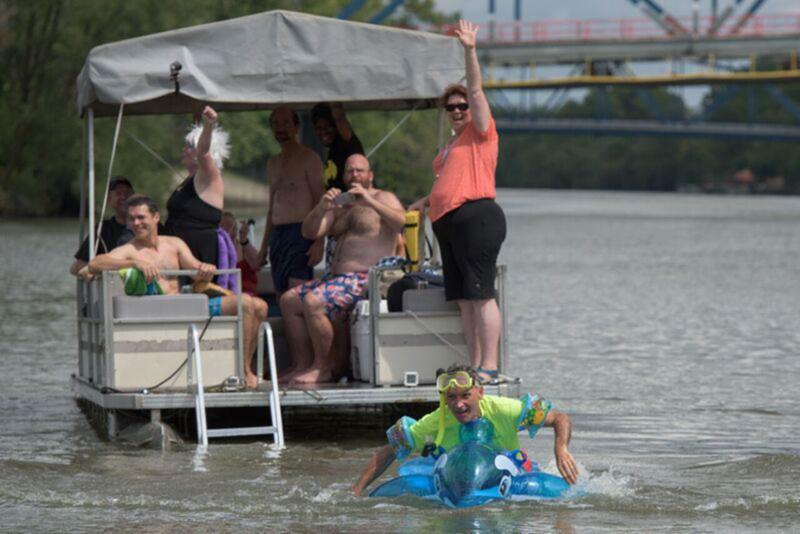 As a fundraiser to support Friends of the Cal-Sag Trail (FOCST), the Plunge demonstrated how a once unimaginable plunge into the Cal-Sag Channel cleaner waters has been made possible by the Metropolitan Water Reclamation District of Greater Chicago (MWRD) and the many advocates, friends and protectors of the Chicago area waterways. Participants jumped off between Chatham Street and Western Avenue in Blue Island, as dozens of spectators viewed from the MWRD's waterfall, also known as a Sidestream Elevated Pool Aeration (SEPA) station. Plungers included MWRD Executive Director David St. Pierre and Alfred Saucedo, aide to MWRD Commissioner Debra Shore, and representatives of the FOCST, South Suburban Mayors and Managers Association, the village of Blue Island, the Metropolitan Planning Council, the National Park Service, the Center for Humans and Nature organization and Friends of the Chicago River. The plungers raised nearly $18,000 towards construction of the remaining 13 miles of the 26-mile Cal-Sag Trail. The funds will also help install improvements to the existing trail, such as water fountains and benches. "It was pretty funny and it was marvelous. 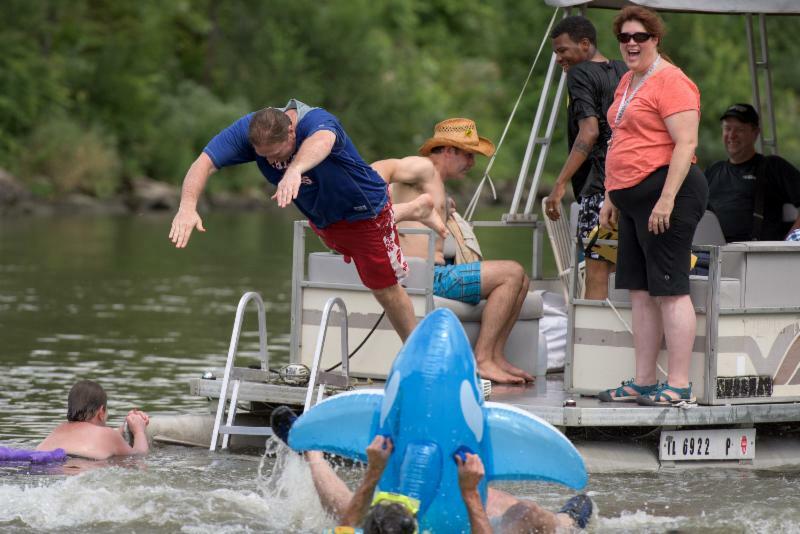 The Plunge signifies a turning point in the river system's history that is monumental -- really and truly monumental," said Margaret Frisbie, Executive Director of Friends of the Chicago River. Matt Binns plunged on behalf of the Friends. 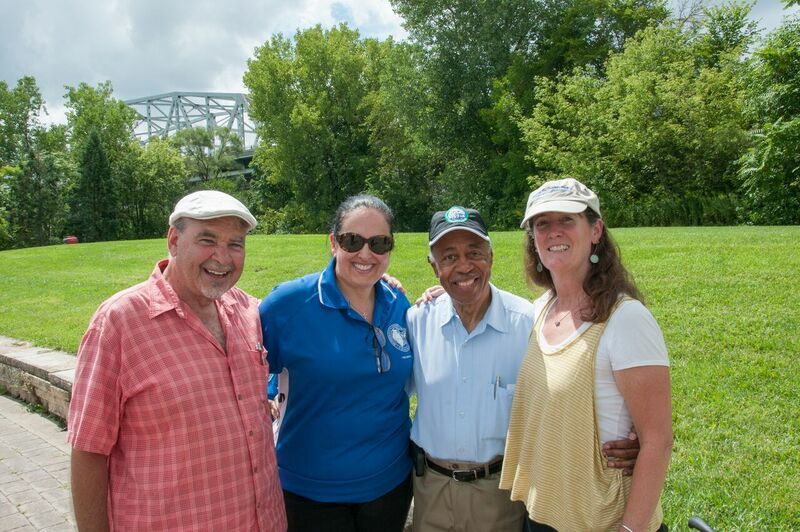 quality in the channel, the Cal-Sag is sure to become a future center for recreation and economic opportunity." The Channel began a remarkable transformation 20 years ago when the MWRD began operating the Sidestream Elevated Pool Aeration (SEPA) stations along the Cal-Sag and Calumet River. Oxygenating the water began to restore ecology to the channel and opened the door to imagining new ideas for the southern corridor, like the Cal-Sag Trail. The SEPA stations near the Cal-Sag Channel and Calumet River add up to 25 tons of oxygen a day to the Chicago Area Waterway System (CAWS) and protect wildlife habitats. "We are happy to work with our many partners to restore, improve and take ownership of our waterways," said Commissioner Shore. "I applaud David, Alfred, Friends of the Cal-Sag Trail and our many brave swimmers who took the plunge. Through new disinfection technologies in the water treatment process, our SEPA stations and the success of the Thornton Composite Reservoir and Deep Tunnel project, we have witnessed less pollution in our waterways. As a result more fish, wildlife, boaters and finally swimmers have been attracted to the area." 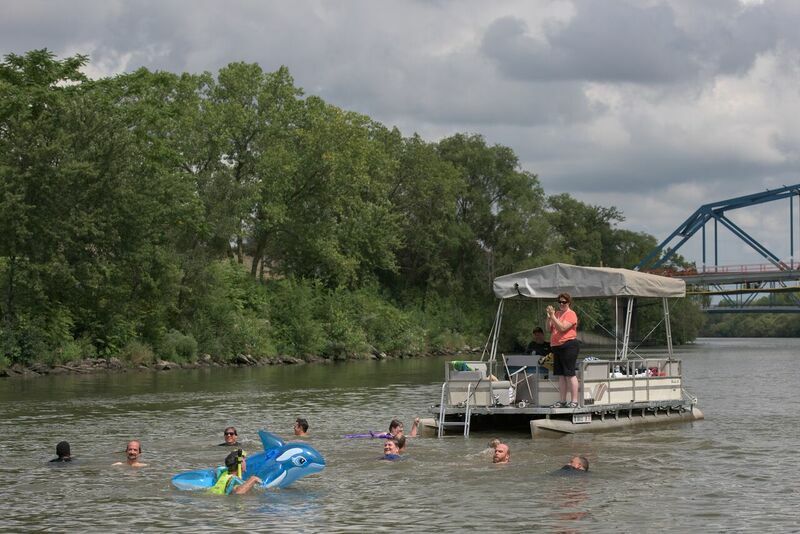 FOCST hopes the event changes long-held misperceptions and attitudes about the waterway. "This isn't your father's channel," said FOCST president Debbie Stoffregen, who plunged into the Cal-Sag. "The Cal-Sag Trail is bringing people to the waterway, who are looking at this with a fresh perspective. They're discovering fishing, and cranes, and even bald eagles along the channel. They're seeing a river, and they're seeing riverfront communities." FOCST began promoting the idea of building a 26-mile bike path along the channel in 2004. The first 13 miles of the trail, between Illinois Route 171 near Lemont and Cicero Avenue in Alsip, opened in June 2015. Much of the trail is on MWRD land that is leased to communities and agencies for the trail. Remaining construction will connect the trail from Alsip to the Burnham Greenway in Burnham near the Indiana border by 2018. 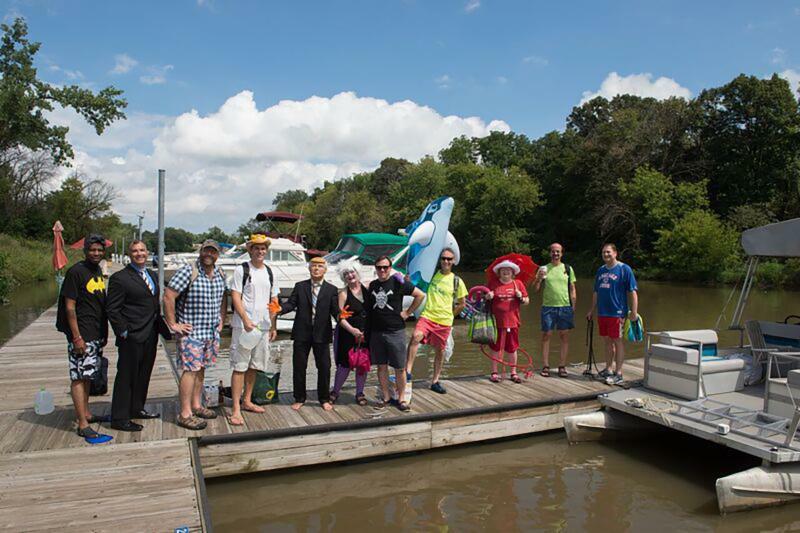 "The work and investments made into preserving these precious waterways has culminated with events like the first-ever Cal-Sag Plunge and points to a closer relationship with our waterways for many years to come," said MWRD Commissioner Timothy Bradford, who attended the event to cheer on the plungers. Plungers prepare to take a pontoon ride to the plunge point in the Cal-Sag Channel in Blue Island. 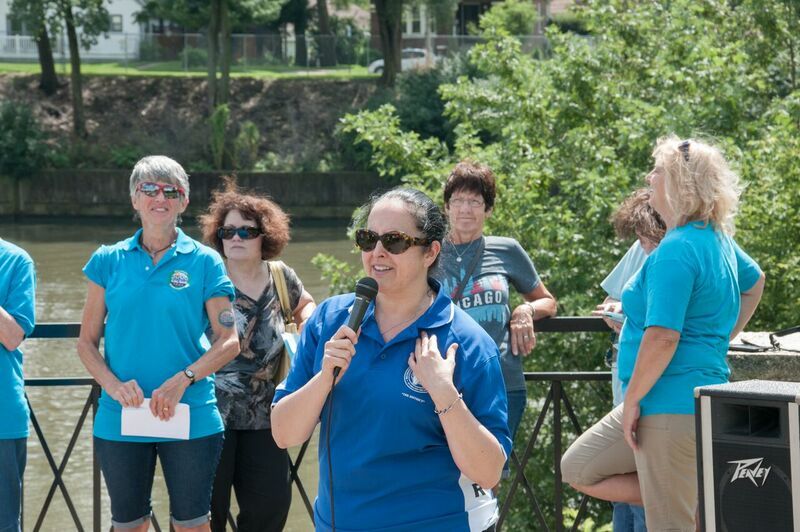 MWRD President Mariyana Spyropoulos addresses onlookers at the Cal-Sag Channel Plunge. 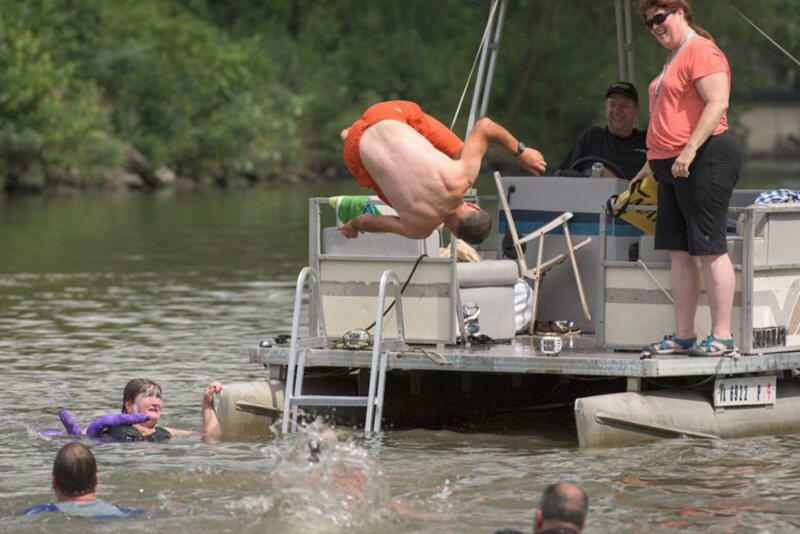 MWRD Executive Director David St. Pierre takes a dive. MWRD Commissioner Debra Shore's Aide Alfred Saucedo jumps in a three-piece suit. Steve Buchtel flips his way into the Cal-Sag Channel. Matt Binns representing Friends of the Chicago River enjoys a ride on his float. Plungers enjoy their final moments in the Cal-Sag Channel. (L-R) Tom Shepherd, Southeast Environmental Task Force, joins MWRD President Mariyana Spyropoulos, Commissioner Tim Bradford, and Margaret Frisbie, Friends of the Chicago River at the MWRD's Sidestream Elevated Pool Aeration Station in Blue Island. Established in 1889, the MWRD (www.mwrd.org) is an award-winning, special purpose government agency responsible for wastewater treatment and stormwater management in Cook County, Illinois.